The rise is down to our new helicopter, a Eurocopter 135, which arrived at our base in Filton in October 2014. In 2015 HM65 and her crew attended 1,655 life-saving incidents across Bristol, Bath, Gloucestershire, South Gloucestershire, North Somerset and parts of Wiltshire. This is an increase of 270 incidents compared to 2014, when we were using our old Bolkow helicopter. Our new helicopter is able land on any hospital helipad. 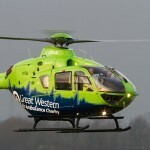 The Bolkow was unable to land on the elevated helipads at the Bristol Royal Infirmary and Gloucester Royal Hospital. Another advantage of the EC135 is the additional interior space, which includes an extra seat. This means that we can transport a relative with the patient, or train new doctors and paramedics. At a time when speed is of the utmost importance, HM65 and her crew have been there for hundreds of people at the worst moment of their life. The EC135’s extra speed means that we reach anywhere in our region within 20 minutes, significantly faster than a road vehicle. It costs £2.3 million for us to stay operational each year, but we receive no day to day funding from the Government or National Lottery. This means we rely entirely on the generosity of the people we serve to continue to save lives.